This LED Game Board was of my own concept & design, constructed during the 48 hour Digital Kitchen "Hackathon" event along with hacker James Griffin. "The DK Hackathon was born from a desire to experiment creatively without client constraints and has become an annual tradition. This year's theme: Gamify." 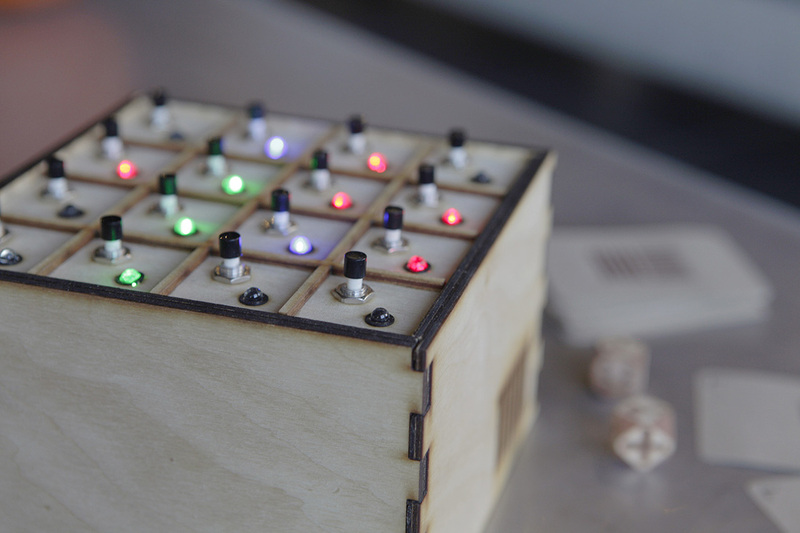 Each space in the 5x5 grid has a RGB LED and a push button switch, both linked to an Arduino. 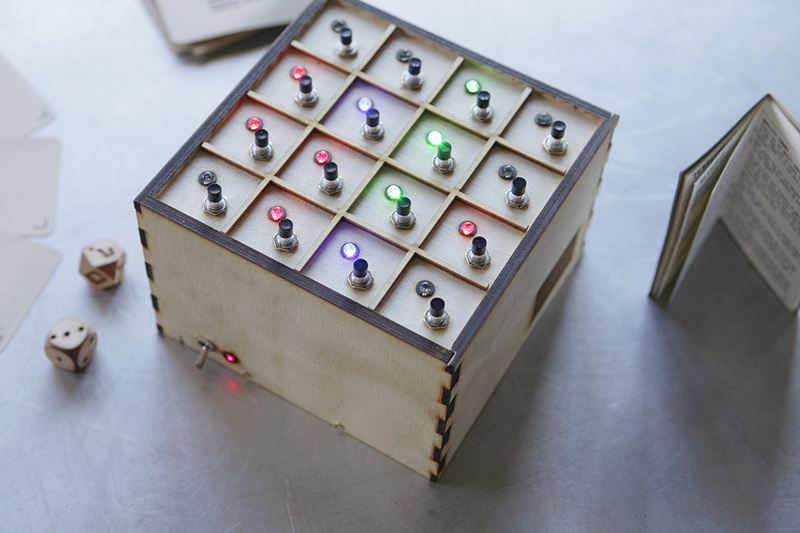 For each space, each press off the button cycles the LED from off, red, green, and blue. We designed the wood case in AutoCAD, and used a laser cutter at Makerhaus to cut the panels out of thin pine slabs. 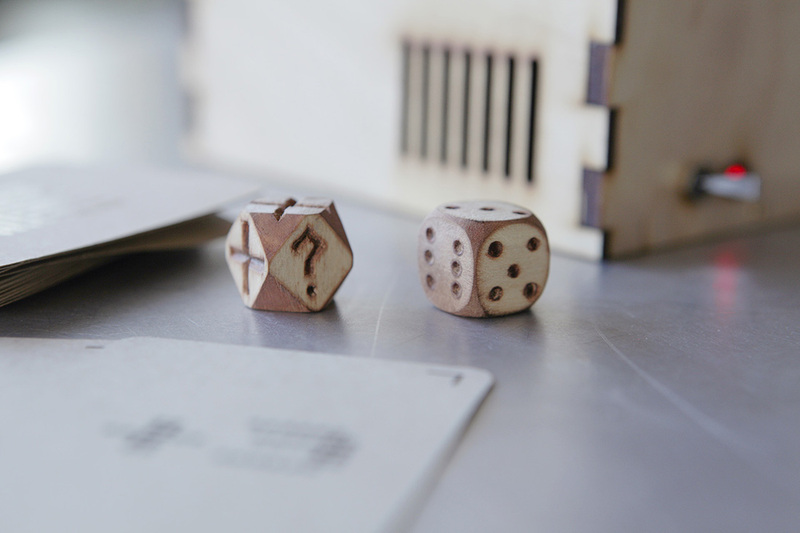 I used a dremel and hand tools to carve the wooden dice. 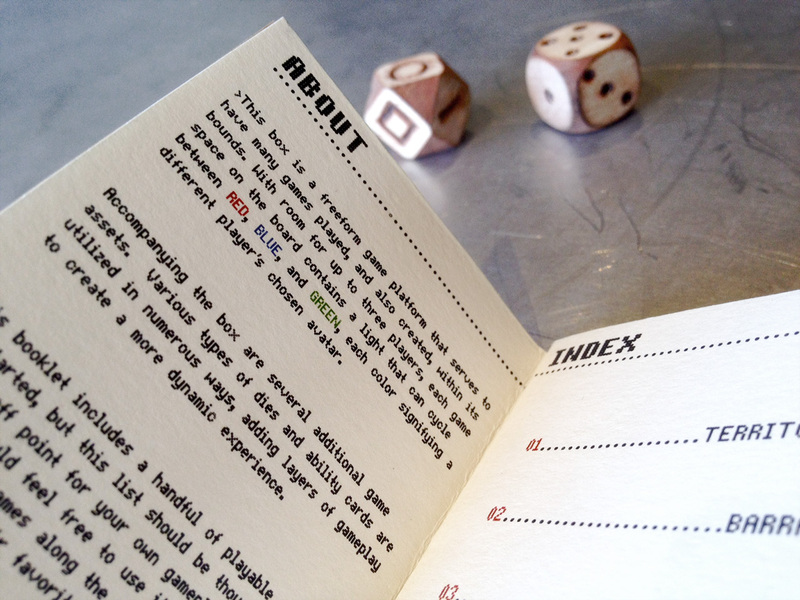 I also designed and created the rule booklet and playing cards. 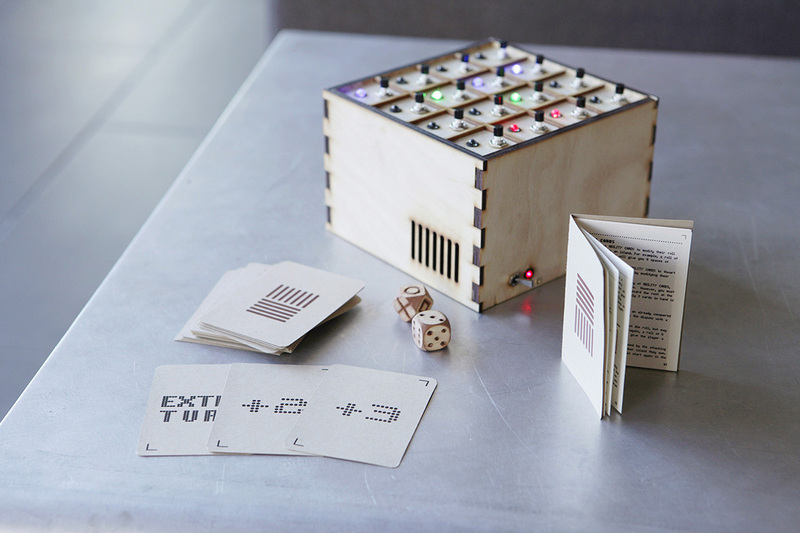 The box is a freeform game platform that serves to have many games played, and also created, within its bounds. A handful of games are outlined in a rule-book, but this list should be thought of as a jumping off point for your own game-play creativity. Players should feel free to use it as they see fit, creating new games along the way or perhaps adapting variations of their favorite classic table-top games. 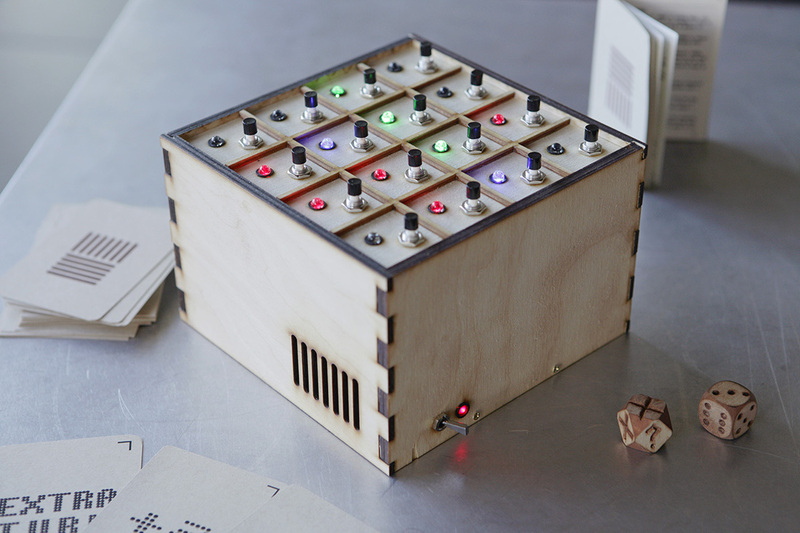 It can function as an arena for any classic grid or spatial based game. The platform’s core mechanism is the usage of LED toggles. Rather than having a game piece you move about a board to signify your place, you just toggle a light to illuminate your player color in a given space. With room for up to three players, each game space on the board contains a light that can cycle between RED, BLUE, and GREEN, each color signifying a different player’s chosen avatar. Accompanying the box are several additional game assets. Various types of dies and ability cards are utilized in numerous ways, adding layers of game-play to create a dynamic experience every time. The platform, with it’s combination of the light box and additional assets, is meant to be dynamic enough to allow constant evolution.